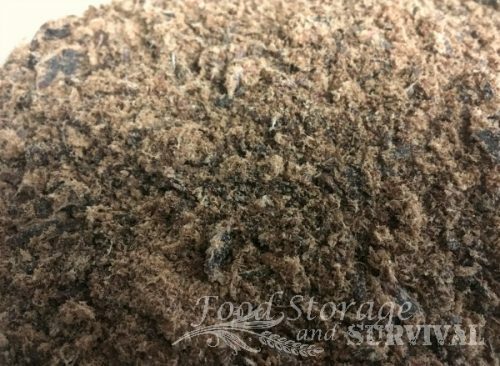 Pemmican has been called the ultimate survival food. It is nutrient dense and fits right in with the paleo diet. It was originally produced in the 18th century by native Americans and French Voyageurs. Pemmican is made traditionally from buffalo meat, although deer, elk, or moose could also be used. None of those available to you? Beef works fine, too. 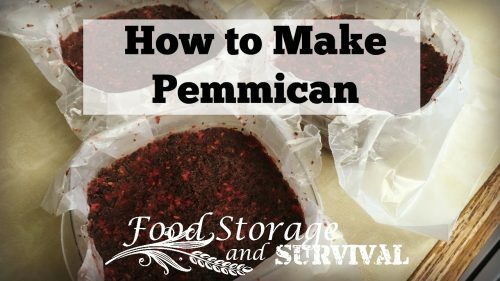 Because it is packable, and ready to eat without cooking, pemmican makes a great savory food for camping, hiking, or survival. Plus it’s pretty straightforward to make. Ready to get started? Lean red meat. You can use wild game like bison, elk, or deer, or domestic meat like beef. This is a ratio by weight recipe, so the amount of meat you use can vary. Suet or tallow. 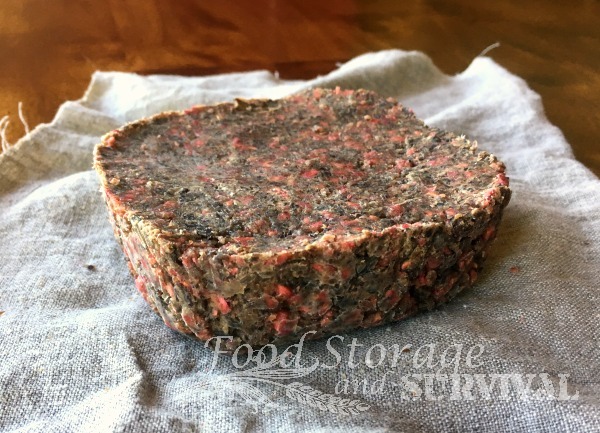 Suet is the raw flaky fat usually found around the loins and kidneys of beef or mutton, and tallow has been rendered from suet. 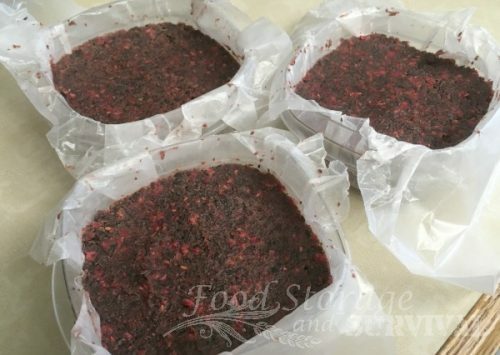 Making your pemmican with tallow will give it a longer shelf life. 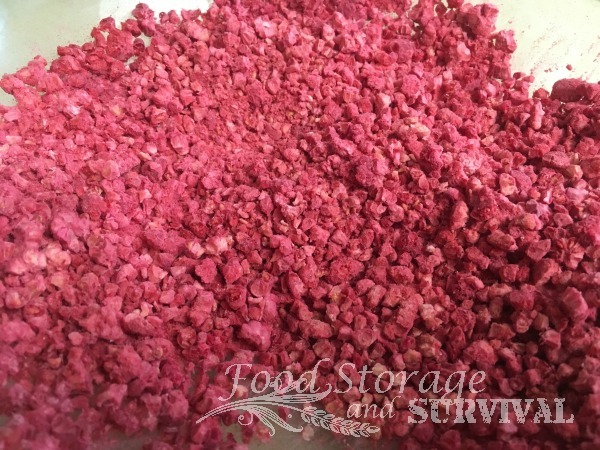 You can get your own suet or tallow from harvesting an animal, or purchase it in a container all ready to use. I used this. Dry berries. Theses are optional! Traditionally choke berries, but you can add whatever you like. I used freeze dried raspberries. You’ll also need some type of mold to press the finished product into. Line a small pan with waxed paper. You could also roll it into balls or I’ve seen it rolled flat between two layers of waxed paper and then cut it into squares. It sets up flexible-solid, but breaks apart easily, so a thin pemmican might be a little more difficult to work with. The meat was traditionally laid out in the open air or dried by the fire. 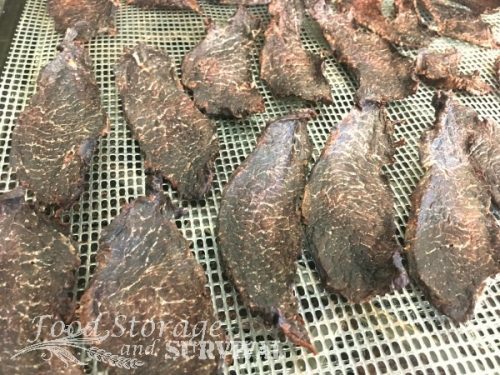 A dehydrator speeds the process up and keeps the flies off your meat. Dry it (at 145 degrees for variable heat dehydrators) until it’s brittle and breaks when you bend it. 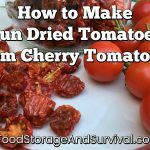 You could also dry it on low temperature in your oven with the door cracked open, or by using a solar oven following your oven’s manufacturer’s directions for drying foods. Step 2: Pulverize the meat. You’re welcome to use a mortar and pestle, but a food processor makes quick work of this step. You want your meat in small pieces and powder. Step 3: Weigh the meat and tallow. Once your meat is pulverized, weigh it. Then measure out the same amount BY WEIGHT of tallow into a pan to heat. So it’s a 1 meat to 1 tallow ratio by weight. Step 4: Weigh the berries. If you are using the optional berries, go with a ratio by weight that is about 8 meat to 1 berries. So for every 8 ounces of meat, you’ll add about 1 ounce of dry berries. I crushed mine a bit. Step 5: Combine the dry meat and berries in large bowl. Just stir them together. Step 6: Melt the tallow. Low heat or a double boiler so it doesn’t scorch. Step 7: Mix it all together and press in molds. 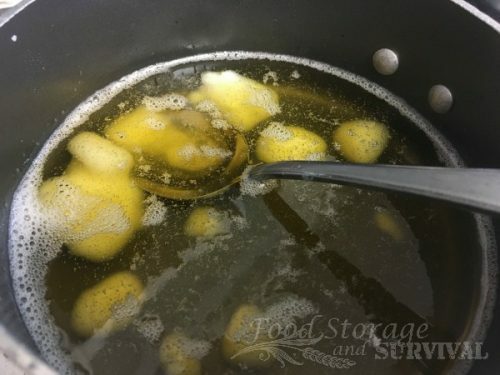 Get it in the forms quickly as the tallow will want to be solid at room temperature and you’re mixing it in with cool ingredients. Let it cool, and it’s done! Pemmican has a mild, meaty flavor. The texture is a bit greasy. You can eat it raw or fry it or put it in soup. To keep it, wrap it in airtight packaging and keep cool and dry. This should keep for months pretty easily if stored properly. Happy eating! I’ve never heard of that before. It was an interesting ready, but sounds like a great protein supplement to use in 72hr kits or for backpacking. Thanks for sharing! I am allergic to all mammal products. Can I use chicken? I don’t know how this would work with chicken. Traditionally a “red meat” dish, I haven’t seen it made any other way. In Alaska, it’s made with fish and seal fat (Crisco if the seal isn’t available) and called akutaq.